Radhanath Swami was on a stroll down the corridor of the monastery. At the entrance of a room that faced the corridor sat Krishnadas at his study desk. The desk held an open scripture with Krishnadas’s face resting on it. He resembled a boxer on the rings, after a knock out. Perhaps a difficult passage from the scripture had pulled him down. Radhanath Swami rambled on, as though he had missed that scene. But the others around could vouch that he hadn’t. As providence would have it, this reoccurred the next day, and even the day after. Krishnadas was crestfallen. Due to emergency services he had insufficient rest for the past few nights. Yet, he sincerely tried to remain awake and study during the day. Coincidentally, however, just when Radhanath Swami was around, he fell asleep. How bad Radhanath Swami might have felt seeing his student asleep at his study desk! What a humility of HH Radhanath Swami. Though he is a spiritual leader, he always thinks as a servant of others. very inspiring story. Simply sweet. Thanks for sharing. The highest consciousness is that of being servant of God and all his children, just like Radhanath swami has, and not being the boss. This is true simplicity and humilty of Maharaj. Maharaj tries to understand everyone and is compassionate to all.. JAI !!! Thank you Maharaj for the wonderful mood you expect every devotee to imbibe.You teach by your example. Statement like can be made only by a pure soul like Radhanath Swami. In this small story, he has shown his heart to all of us. so humble and sweet reply by Radhanath Swami Maharja. The way Radhanath Swami Maharaj deals with juniors and seniors and all for that matter is always very exemplary. Radhanath Swami is so umassuming and humble. This is brought out by this incident. Thank you for sharing. H.H Radhanath Swami Maharaj is so humble. This is another perfect example that speaks about His Holiness Radhanath Swami Maharaj’s simplicity and humility. Radhanth Swami’s reply is beyond imagination of lesser mortals like me. Maharaj’s humility is beyond explanation. beautiful…shows the heart of our dear spiritual masters! Thank you for sharing this beautiful narration. Only Guru Maharaj can take this most humble position in practice!Haribol! Haribol….Vaisnavera kriya mudra vijne na bujhaya!!! All Glories to His Holiness Radhanath swami Maharaja!! Thank you for sharing this wonderful pastime. Maharaj is really so loving. Such nice and comforting words by Radhanath swami! 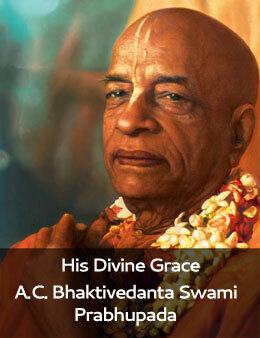 Greatest humility exemplified by Radhnath Maharaj and the perfect trust entrusted on his disciple.Hare Krsna ! i am not your boss, i am your servant trying to serve you in capacity of spiritual master” What humility and that too with humour! Maharaj alwasys displays these qualities of simplicity, humility, compassion for us to imbibe and flollow. Thanks for sharing. Radhanath Swami teaches so much just by his humility and behaviour even without chastisement!